Haven’t decided on a hotel yet? You can look at other available hotels in the counties of Berkshire, Hampshire, Kent, Oxfordshire, Surrey, and Sussex with Booking.com. 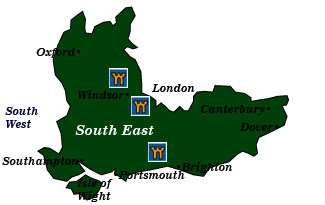 England’s South East region offers some of the most picture-perfect countryside in Britain. Meadows, hop fields, and forests nestle in rolling hills where the only movement comes from grazing sheep and roaming deer. Charming thatched-roof cottages and country pubs, tucked away in storybook villages, seem untouched by modern civilization. Dozens of mighty castles and grand country houses—all open for exploration—reveal layers of English history that recount the rise and fall of their noble owners. Although any of the sights of the region can be visited on a day trip from London, basing yourself in a historical castle hotel in the English countryside will be the high point of your trip. Canterbury Famed for its great cathedral—one of the finest examples of Gothic architecture in the world—Canterbury is filled with historical associations, especially in its splendid medieval center. Dover Castle Impregnable and mighty, this Norman castle is perfectly situated to view invading forces across the English Channel. Hever Castle Turrets and battlements surrounded by a lily-filled moat distinguish the childhood home of Anne Boleyn, second wife of Henry VIII (who later gave the castle to Anne of Cleves). Gorgeous gardens, which include a water maze, and fun-filled summer activities, such as falconry and jousting exhibitions, make Hever Castle a first-rate castle to visit. Leeds Castle With 9th-century origins, the Normans rebuilt this superb castle in the 13th century. Sometimes named the most beautiful castle in England, it sits in its own lake. A favorite of Henry VIII, he converted the castle to a palace and sent his first wife, Catherine of Aragon, here to live. Rochester Castle Norman military architecture at its finest, its foundation lies on an ancient Roman city wall that stands a 125 feet, the tallest in Britain. Penshurst Place One of oldest of England’s grand country homes, Penshurst was originally built for the wealthy London merchant Sir John de Pulteney in 1341. The great baron’s hall alone measures 64 feet long and 60 feet tall. Chartwell For over 40 years, this brick Victorian mansion was home to World War II prime minister Winston Churchill. Books, maps, paintings, and gardens look like Sir Winston will walk in at any moment. Chartwell is one of the most visited National Trust properties. Knole Built in the late 15th century, this great Tudor mansion was seized by Henry VIII from the Archbishop of Canterbury. In 1566, Queen Elizabeth I gave the property to her cousin Thomas Sackville, whose descendants have since retained ownership. Writer Vita Sackville-West set her novel The Edwardians here. Ightham Mote An exquisite example of medieval architecture little changed since the 14th century, this stone and timber grand manor house is surrounded by a moat. Sissinghurst Castle Garden Set around the ruins of a moated Tudor castle, the gardens present a splendid show, especially in June and July. Lewes Although 12th-century Lewes Castle and the architectural gems of the town are well worthy of a visit, it’s the Guy Fawkes Night (November 5) bonfire celebrations that brings the crowds to town. Rye Screaming authentic medieval atmosphere from every stone cobble and half-timbered cottage, this enchanting little village—once a smugglers’ haven—is filled with antique shops and antiquarian bookstores. Battle History buffs will appreciate visiting the site of the Battle of Hastings, marking the victory of William of Normandy over King Harold in 1066. Bodiam Castle As romantic as any fairytale, this 14th century castle, complete with battlements, turrets, and a wooden portcullis, is surrounded by a wide moat. Herstmonceux Castle Presently owned by Canada’s Queen’s University (who gives tours through part of the castle), Herstmonceux was built in 1444 by Sir Roger Fiennes, an ancestor of actor Ralph Fiennes. Petworth House One of Britain’s grand houses, its fame lies with its outstanding art collection, including twenty works of Turner. Fishbourne Roman Palace Under-floor heating, indoor plumbing, and intricate mosaics distinguish this 1st-century Roman villa, the largest in Britain. Portsmouth Those interested in maritime history will enjoy visiting the Historic Dockyard, home to the HMS Warrior, England’s first ironclad battleship, and the HMS Victory, Admiral Nelson’s flagship from the Battle of Trafalgar in 1805. Raised in 1982, the Mary Rose is a splendid example of a naval vessel dating from the Tudor era. It is from Portsmouth, too, that the Mayflower in 1620 and the Titanic in 1912 sailed. Not far away is the D-Day Museum, highlighted by the 272-foot-long Overlord Embroidery, depicting the WWII Allied landing in Normandy. Portchester Castle Incorporating Roman walls existing from the 3rd century, this Norman-built castle was used by Henry V to assemble his army before the Battle of Agincourt in France in 1415. Isle of Wight Distinguished by a mild climate and Victorian-age overtones, visitors come to hike, enjoy the famous Cowes Week sailing regatta, and simply relax. Queen Victoria’s home, Osbourne House, is the island’s most popular site. Carisbrooke Castle, built by the Normans and modified during the Elizabethan age, became the prison of King Charles I during the English Civil War. Chawton Lovers of Jane Austen’s books will not want to miss visiting the home where she penned (or worked on) her greatest books: Pride and Prejudice, Sense and Sensibility, Emma, Persuasion, and Mansfield Park. Broadlands is one of the great Hampshire houses and home of the late Lord Mountbatten, uncle of Queen Elizabeth and last viceroy of India. Windsor Jaw-opening massive, Windsor Castle is the largest inhabited castle in the world—inhabited lovingly by Queen Elizabeth II. Parts are open to public viewing. Stretching to the south,Windsor Great Park is incorporated in the remains of an ancient royal hunting forest. Within, one of Queen Victoria’s favored homes, Frogmore House, is open for visits, too. Oxford The University of Oxford is comprised of 39 distinct colleges, including world-famous Christ Church and Magdalen College. Ashmolean Museum—Britain’s oldest public museum with a fine collection of antiquities, and Radcliffe Camera and Bodleian Library are itinerary musts. Blenheim Palace The only British grand home named by UNESCO as a World Heritage Site, magnificent 18th-century architecture and extensive gardens distinguish the childhood home of Winston Churchill. Hiking and biking the Thames A terrific walk for serious hikers is the Thames Path National Trail, which follows the river from its source near Cirencester to London. The entire trail takes about two weeks or so. Cyclists can try out the Thames Valley Cycle Way from Oxford to London, which is part of the larger National Cycle Network.